EL SEIBO, DOMINICAN REPUBLIC - OCTOBER 14, 2013: Children attend art class at La Higuera elementary school in an impoverished batey on a sugar cane plantation in El Seibo. 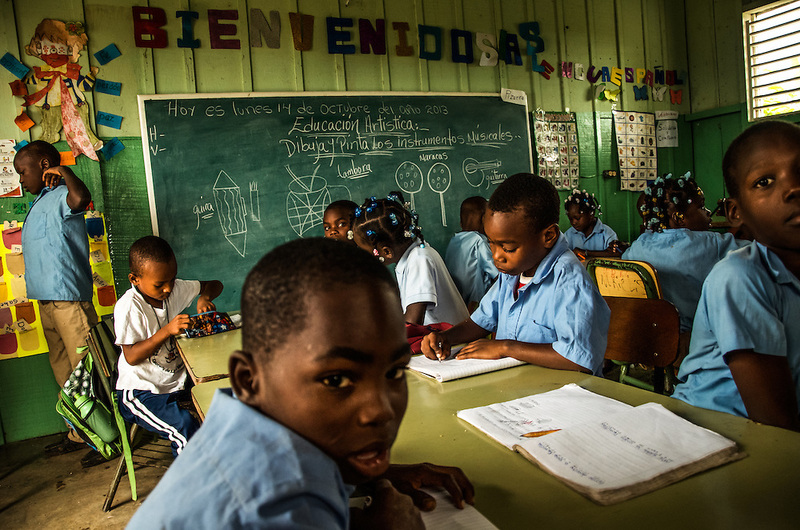 According to Tirson Ubiera, 48, the director of the school, 90 percent of students that attend classes here are affected by judgment TC/0168, handed down by the Constitutional Court of the Dominican Republic. The ruling essentially revokes Dominican citizenship from tens of thousands of people born in the Dominican Republic, which means they cannot have access to government services, id's necessary for legal work and travel, and the children cannot attend public school. The Inter-American Commission on Human Rights has expressed that the ruling would leave affected people stateless, which is a violation of the American Convention on Human Rights. "If the Education Ministry gives us an order to require papers, the school will be empty," Director Ubiera said. "Without papers, without an education, their [affected students] futures are black." "If they don't have their documents or id's, they cannot work in any organized sector…they will stay here cutting sugar cane, just like their fathers."